XP System Properties lots of stuff in this! Computer Name: As it sounds, put a name to your Machine. 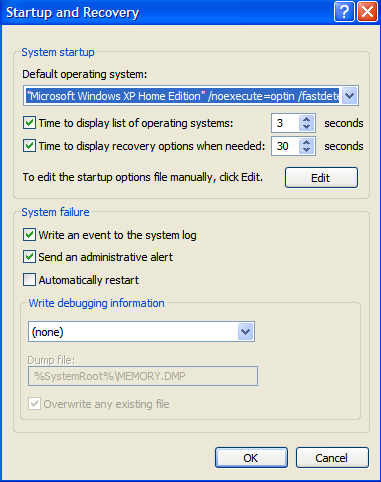 System Restore, I Disabled it, but you should leave it on and at the default settings. Automatic Updates: turned it off, I do it manually weekly, you should leave this on. Remote: I do not want any computers Remotely connecting to my harddrive or Desktop, I turned them off, you decide. In the Advanced Tab: Performance, User Profiles, Startup and Recovery. 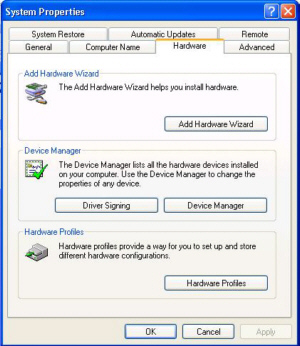 This is the Hardware Tab, this is where you find the all important Device Manager. 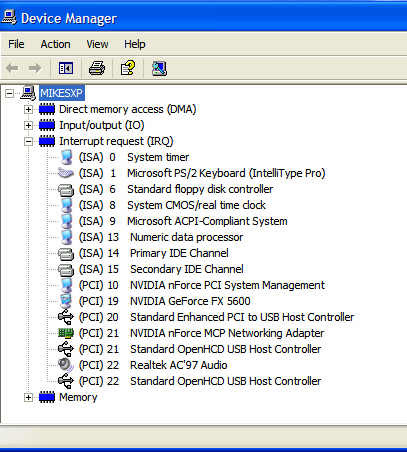 The list of all the Hardware on your computer. In the Device Manager, if you go to View-Resources by Type-Interrupt request (IRQ), you will find all the IRQ Addresses. Why are IRQ important, well let say you install a Network card or a Sound Card and they are having problems or the computer is acting wierd. Chances are there is a problem with 2 hardware devices sharing an IRQ, which will create a conflict. This especially is prevalent with adding a Network card, check the IRQs and make sure each Device has it's own IRQ, this is how they talk to the CPU and the CPU knows by the IRQ what Device it is talking to. Some Devices need a Host Controller, which shares the IRQ with the Device. 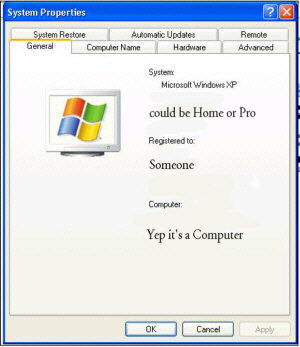 Windows XP is really good with assigning IRQs, 95, 98 and Me do have problems, usually if you go to the Device Manager and Remove the Device, shut down the computer, remove the device and move it to a different PCI slot, Windows will usually fix the conflict by assigning it an IRQ that is not been used. 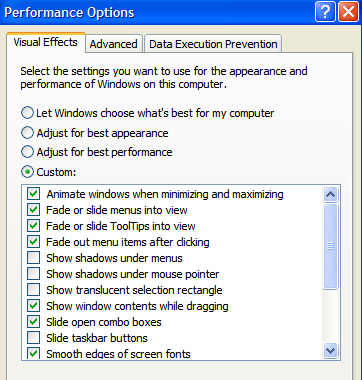 If you open the Advanced Tab and go to Performance and click the Settings button, you can adjust the way XP GUI appears. The Radio Buttons are the fast easy way, let Windows choose-the default setting, best appearance-uses the most CPU and ram usage, best performance-for a system with not enough ram and Gamers and Custom settings-I use this, I want it to look good, but some of it just isn't needed. If you choose Startup and Recovery-Settings button in the Advanced tab, the first section is the Boot Option. If you have another Operating System on the harddrive, you can set what Operating System the computer starts to and the amount of time you get to choose which Operating System it boots to. The 2nd option System Failure, I would leave them to the defaults, unless you know what you are doing.